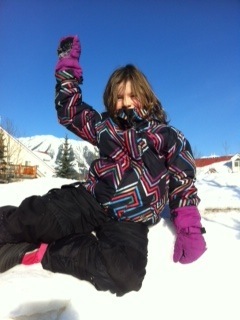 We were in Fernie on the weekend and decided not to ski on Sunday. Instead, the children conquered all the snowbanks around the condo parking lot. There’s something about a snowbank that kids love — it turns into a mountain to climb, a slope to slide down, a fort to hunker behind and launch snowballs. Forget the mountains, we’ve got these mini-glaciers to scale, Mom. Since it snows a lot in Fernie (over 600 cm so far this season), the snowbanks can become really tall. Like 10 feet or more high. The kids spent a good hour clambering up and then slipping down the snow plow-created icebergs. It was awesome to watch their creativity as flat slabs of snow became beds to lay on and even a kitchen table to sit around. 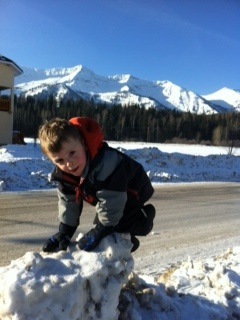 Yes skiing Fernie is fun, but sometimes a kid’s just gotta show the snow mountain who’s boss! Forget Polar Peak — Avery has just conquered another snowbank. We’re trading the snow for some desert sun on a vacation to Arizona. Follow our adventures in the Grand Canyon state as we travel from Phoenix to Sedona and Tucson. This entry was posted in Outdoor Adventure and tagged Fernie, Fernie Alpine Resort, Snowbank climbing, winter activities with kids. Bookmark the permalink.